The shoulder is a synovial joint composed of three bones: humerus, scapula, and clavicle. Overall, stability is achieved through the static and dynamic restraints. Normally the head of the humerus remains centered in the glenoid fossa. This allows for the joint surfaces to align congruently with one another. In addition, the glenohumeral joint reaction force is contained within the glenoid arc (Figure 1). 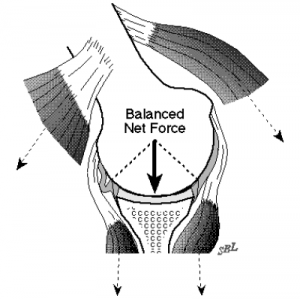 However, in the case of shoulder dislocation, there is a disruption in the net glenohumeral joint reaction force (Figure 2). This causes the humeral head to fall outside the glenoid arc (Figure 3). The static restraints consist of joint conformity, adhesion/cohesion, finite joint volume, and ligamentous stability including the labrum. The inferior glenohumeral ligament (IGHL) is the primary ligmentous restraint to anterior glenohumeral translation, specifically with the arm abducted and externally rotated. As a result of this anterior translation, the anterior inferior labrum and capsule can detach. This is known as a Bankart lesion.The dynamic restraints are composed primarily of the rotator cuff muscles, but also include the scapular stabilizer musculature and the biceps. Shoulder dislocations can occur in four directions: anterior and posterior. The most common is due to trauma from a direct posterolateral force on the shoulder. Individuals may also present with a direction of instability that can predispose them to a dislocation. 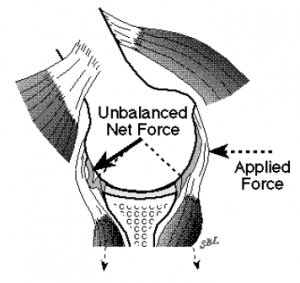 In this case, the muscles are "unprepared" or the force "overwhelms" the muscle (Figure 4). An anterior dislocation accounts for 97% of recurrent or first time dislocations. It is the most common dislocation and is caused by the arm being positioned in an excessive amount of abduction and external rotation. In this position, the inferior glenohumeral complex serves as the primary restraint to anterior glenohumeral translation. Due to a lack of ligamentous support and dynamic stabilization, the glenohumeral joint is most susceptible to dislocation in the 90 degree abduction and 90 degree external rotation (Figure 4). Supporting structures that may be deficient in an anterior dislocation are the anterior capsule, long head of biceps, subscapularis, superior and middle glenohumeral ligaments. When there is a thinning in the anterior capsule, it may present between the superior and middle glenohumeral ligaments. As a result of its inherent weakness, the humeral head is more prone to dislocate at this interval. When an anterior dislocation results from a traumatic event, the anteroinferiorly displaced humeral head stretches and typically tears resulting in a loss of integrity of the anterior ligamentous capsule, often resulting in a detachment of the anterior inferior labrum and may have a Hill-Sachs lesion present. In severe cases, concurrent rotator cuff injuries may occur. Posterior dislocation is less common as it accounts for 3% of shoulder dislocations. It is caused by an external blow to the front of the shoulder. There is an indirect force applied to the humerus that combines flexion, adduction, and internal rotation. This is usually the result of one falling on an out stretched hand (FOOSH injury), MVA, or seizures. Due to the traumatic mechanism of injury, posterior dislocations may also have concurrent labral or rotator cuff pathology. On thorough examination, the patient may also present with damage to rotator cuff musculature, bone, vascular, and nervous structures. Vascular structure damage is a result of traction of the brachial plexus and axillary blood vessels that occur during a dislocation. A clinician can determine if an axillary artery injury is present by looking for reduced pulse pressure or a transient coolness in the hands. 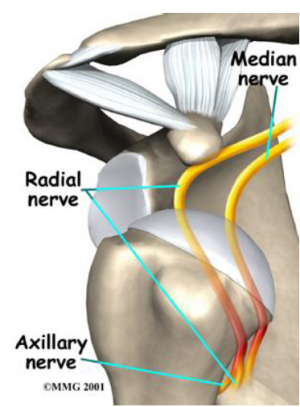 Peripheral nerve injuries following an anterior dislocation is common because of the proximity of the brachial plexus (Figure 6). Literature reviewing the most current research suggests that individuals between the ages of 15-25 should undergo surgical repair of a dislocation because individuals in this group are considered a high risk. However, limited evidence exists in this population. The recurrence rate of dislocations in young active individuals can be as high as 92-96%. In the age group 25-40, initial suggestions are to try conservative rehabilitation because the risk of redislocation is lower, around 40%. 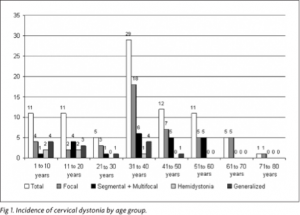 Individuals whom are 40 and older also have a low recurrence rate around less than 15%. The recommended management is non operative and to address associated issues. With surgical repairs, it is best to operate within 2 weeks because tissue conditions are still optimal. Refer to rule out a fracture if dislocation is suspected. Pre-reduction radiographs are necessary to determine direction of the dislocation and to asses for any associated fractures. If a glenoid rim fracture is observed on the initial radiograph. a CT scan can be done to determine the size of the fracture. An MRI can be used to rule in or rule out any soft tissue pathologies. As clinicians, it is important for us to know the results of imaging to help guide us in our treatment process. Medical diagnostics will largely depend on local protocol, but may include plain radiographs (A/P, stryker notch or Westpoint views), CT or MRI scans. Wang and colleagues, suggested a three phase protocol discussing some recommendations for this phasic approach. It has traditionally been thought to be immobilized with internal rotation, but according to Miller, immobilization has been beneficial in external rotation because there is more contact force between the glenoid labrum and the glenoid. Research by Itoi suggests immoboilization at 10 degrees of external rotation has a lower recurrence rate than internal immoboilization at 10 degrees of external rotation has a lower recurrence rate than internal rotation. There is currently no consensus on the duration of immobilization in a sling. But, typical time periods in a sling range for 3-6 weeks if under the age of 40 and 1-2 weeks if older than the age of 40. During the immobilization period, the focus is on AROM of the elbow, wrist and hand and reduction of pain. Isometrics can be incorporated for the rotator cuff and biceps musculature. When stretching is permitted, passively stretch the posterior joint capsule through the use of joint mobilizations or self-stretching. Strengthening exercises should be impairment-based. Typically begin strengthening exercise in a pain-free motion with exercises for stability. A possible progression could begin by focusing on the rotator cuff musculature and scapular stabilizers, which include trapezius, serratus, levator scapulae, and rhomboids. Then, progress to the larger musculature such as the deltoids, latissimus dorsi, and pectorals. ↑ 2.00 2.01 2.02 2.03 2.04 2.05 2.06 2.07 2.08 2.09 2.10 Boone JL, Arciero RA. First-time anterior shoulder dislocations: has the standard changed? Br J Sports Med. 2010;44:355-360. ↑ Scheibel M, Kuke A, Nikulka C, Magosch P, Ziesler O, and Schroeder J. How long should acute anterior dislocations of the shoulder be immobilized in external rotation? Am J Sports Med. 2009; 37:1309-1316.